Contributed by Richard Pittman I started with Spalding in 1968 as a inside salesman and went on the road for them in 1972 through 1990. I was a Golf and Tennis salesman and called on the Pro Shops for golf and tennis as well as tennis & golf speciality stores. 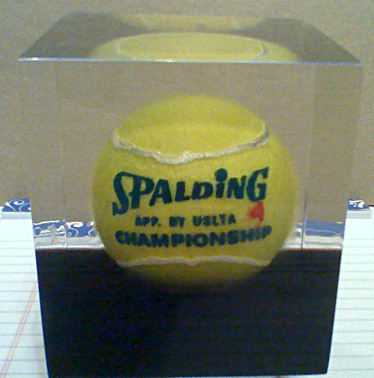 The Professional tennis ball was sold to Tennis Pro Shops only and was sold on a limited production availability. The balls were never made in large quantities because tennis pro shops never bought “large” amounts, maybe a gross or three at a time. So, the balls were shipped from Chicopee, Ma. to each of our, then, warehouse facilities in small quantities. They were sold 6 dozen (24 cans) at a time and were stored in a refrigerator to keep them “fresh” for the Tennis Professionals that stocked them. Some tennis pro shops kept them in a frig at their store with a sign that told customers the balls were available upon request. The Professional Tennis ball was in the line from 1965 till 1969. The Championship balls were discontniued in 1987. In 1970 the Championship balls whosale price was $2.03 per can. Sometime in the mid 1980’s, I can’t remember exactly when, the president of Spalding stopped the production of tennis balls due to the fact that the company was not making money on the product anymore. So, what he did was take the last 100 balls made and had them encased in a square cube of clear lucite and gave them to various employees at Spalding.